Recently, we released a beautiful image of Stephan's Quintet, showing a group of galaxies and the effects of a galactic collision. In our caption we noted that NGC 7320, the blue galaxy near the bottom of the image, is not a member of the group but is located much closer to the Earth. This is because, as stated in the journal paper by Ewan O'Sullivan, NGC 7320 has a much lower redshift than the other galaxies, and a lower redshift means a smaller distance according to standard cosmology. This release led to several online posts including a nice article from Alan Boyle on his blog "Cosmic Log" at msnbc.com. group. If there is, indeed, a physical connection between NGC 7320 and NGC 7320c it would discredit a pillar of modern cosmology, since these objects should be great distances apart given their very different redshifts. The presence of a second tidal tail in optical images of the group is not controversial and is noted in papers going back at least 20 years. 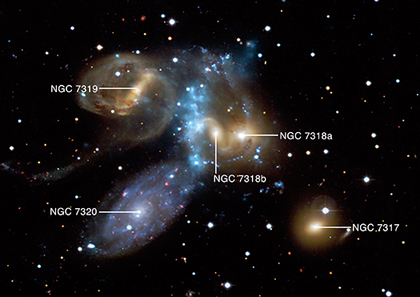 Radio observations prove that the tail is unrelated to NGC7320 and is actually connected to the X-ray mission and the two spiral galaxies on the right (NGC7318a/b). The radio lets us see cold neutral hydrogen gas in the tails and trace the southern tail even where it passes behind NGC7320; there is no sign of disturbance in the gas or a connection to NGC7320, and the hydrogen is at the redshift of the other galaxies. The fact that a background quasar can be seen through the disk of NGC7319 does not make it special; the galactic disk is quite thin and much of the gas and dust has been stripped out of it by encounters with the other galaxies. Arp's arguments (published in the Astrophysical Journal in 2005) rest on the idea that it is very unlikely to find a background quasar whose position in the sky is so close to the center of the galaxy. However, his estimate of the number of quasars in the sky is too low, and misses the point that the gravity of galaxies (and groups or clusters of galaxies) will act as a lens, making it easier to detect quasars behind them. In the same year a study looking at quasar counts behind 200,000 galaxies in the Sloan Digital Sky Survey showed the numbers to be exactly as predicted by standard cosmological models. While there are always uncertainties in our interpretation of astronomical data, the evidence against Arp's ideas is pretty overwhelming. One of the wonderful things about modern astronomy is that almost all scientific papers (and many of the actual observations) are freely available on the web - if you really want to make up your own mind, why not see what the experts and the best data have to say?